Today on Reade and Write I welcome Amy Metz back to the hot seat. She’s been here before, back in June of 2015, to discuss her book Heroes & Hooligans in Goose Pimple Junction. 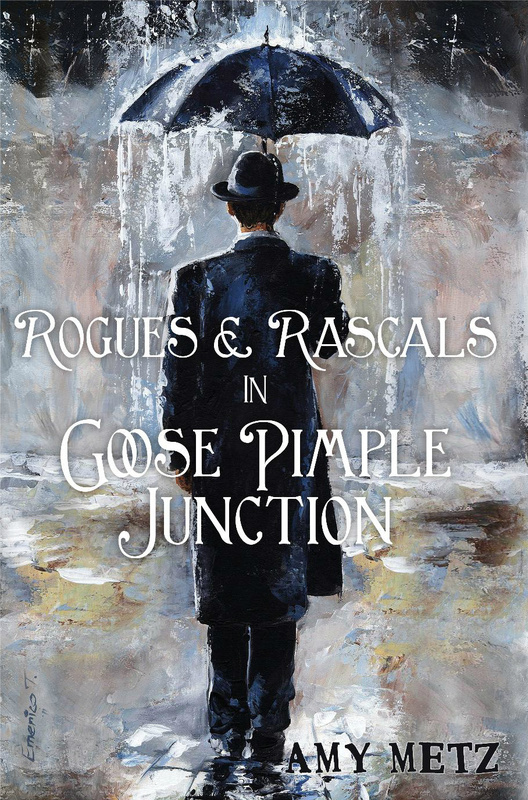 She’s back now to discuss her newest release, Rogues & Rascals in Goose Pimple Junction. For those of you who haven’t read any of Amy’s books, I highly recommend them. They’re chock-full of humor, mystery, and Southern wisdom. Good to have you back, Amy! 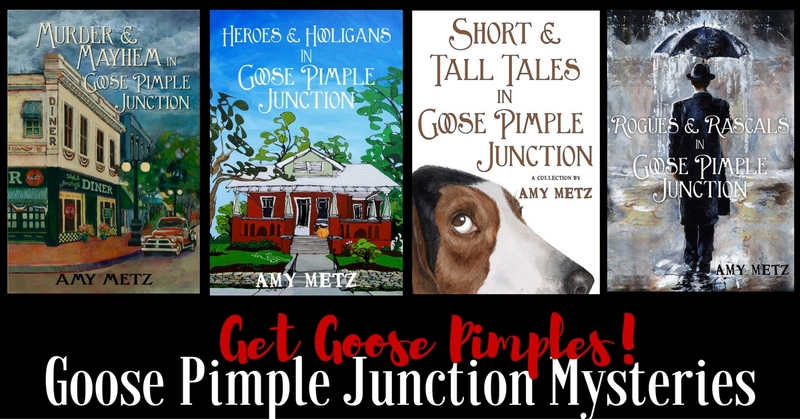 Rogues & Rascals in Goose Pimple Junction was released in May and is the fourth book in my humorous mystery series. The main characters are Wynona and Caledonia, two very different women, but two women who also have more in common than one might think. Forever. A least it seemed like it. Realistically, more like a year. I pretty much write linearly. Sometimes I write the first and last chapters and then fill in the middle, but I haven’t done that with the book I’m currently writing. Maybe I should try that. Wynona has a mother who is a little crazy. Okay, a lot crazy. Yes, the temperature has to be 74 degrees exactly. I need sweet tea with lemon, M&Ms—green only—and someone to rub my shoulders while I work. Just kidding. I don’t have any rituals that I can think of. I don’t know that you’d call it a retreat, but I went to the Mad Anthony Writers Conference (http://www.writelikemad.com/) in Hamilton, Ohio, a few years ago. I learned a ton and wish I could go to more of them. 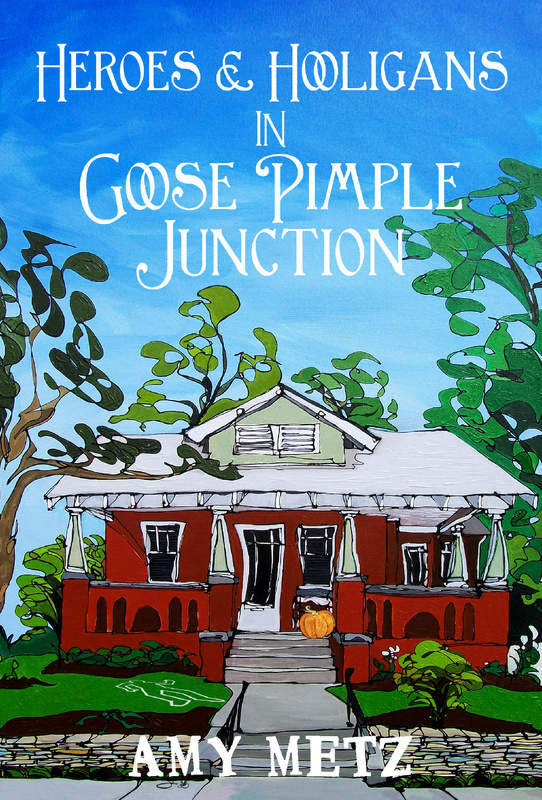 I’m working on book 5 in the Goose Pimple Junction series, Liars & Lunatics in Goose Pimple Junction. I’m also working on a thriller titled Wax Man. Rogues & Rascals in Goose Pimple Junction was dedicated to a man named Robert, who I never actually met in person—we only knew each other online. I met him when I first started writing. He was the best beta reader I ever had and was instrumental in books one and two. He always had great suggestions, was brutally honest, and he kept me writing at times when I didn’t want to. I sent him chapters as I wrote them, and I think that immediate feedback helped me write faster than I do now. He passed away in January 2015 and never read Rogues & Rascals. Do you prefer to read a physical book (with paper pages that really turn), or do you prefer an ereader, or perhaps audio books? I actually read more audiobooks than any other form, because I listen to them in the car or when I’m puttering around the house. They also help me get to sleep. I like ebooks when I go somewhere and need to fill down-time while waiting for something or someone. But if you’re talking prefer, I prefer hardback books. I think each form plays an important role! I’d love to be able to give away gift certificates to bookstores or even paperback copies of GPJ books. Right now it’s just not in the budget. All four books in the series are available on Amazon.com. Thanks so much for joining me on Reade and Write today! Before I get started, I’d like to let everyone know that Secrets of Hallstead House was featured as the Cool Book of the Week on Amy Metz’s blog, A Blue Million Books. I’d love for you to check out the post: you can find it at http://abluemillionbooks.blogspot.com/. You may have to scroll down just a bit, but I promise it’s there. 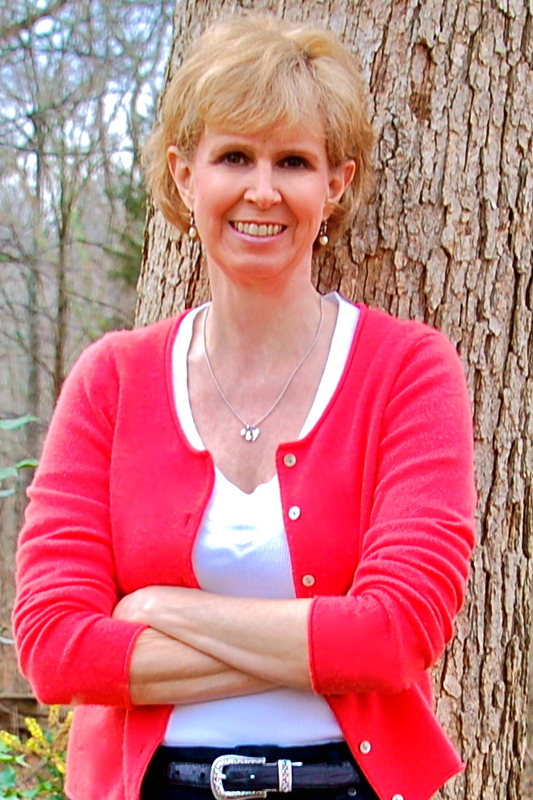 Many thanks to Amy Metz for the opportunity to appear on her blog! This past weekend I had the privilege of attending the Suffolk, Virginia Mystery Authors Festival, hosted by the Suffolk Division of Tourism in partnership with the Suffolk Center for the Cultural Arts and the Suffolk Public Library. It was a gathering of twelve very talented and prolific mystery writers, a literary agent (Dawn Dowdle), a freelance editor (Jeni Chappelle), several members of the Virginia chapter of Sisters in Crime, and hundreds of very happy readers. I had the opportunity to meet and chat with the likes of Ellery Adams, Mollie Cox Bryan (who shares my Kensington editor), Mary Burton, Erika Chase, Vicki Delany (who also writes as Eva Gates), Linda O. Johnston, Joyce and Jim Lavene (who write together as Ellie Grant and J.J. Cook), Maggie Sefton, Gayle Trent (who also writes as Amanda Lee), LynDee Walker, and Wendy Lyn Watson (who also writes as Annie Knox). 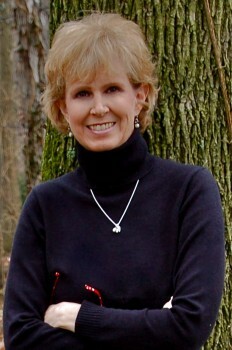 Many of these authors write cozy mysteries. The cozy is a sub-genre of crime fiction in which the main character, generally a woman, is an amateur sleuth with a day job that allows her to interact with members of the close-knit community in which the crime usually takes place. The cozy is populated with quirky-next-door-neighbor-type characters and the reader gets to know many members of the community as a cozy series progresses. Often the main character has a close relationship with a member of law enforcement (say, a brother, best friend, boyfriend, ex-husband, etc.) and you’d be amazed at how often cats, dogs, and other animals are important cast members. Cozies tend to be on the milder side of crime fiction and generally avoid strong cursing and graphic descriptions of violence and intimacy. It is common to find the main character’s job or hobby (such as knitting, scrapbooking, or animal rescues) as a theme throughout a cozy series. But not all the authors I met write cozies: some write novels and stories that are a bit darker, such as Mary Burton’s Cover Your Eyes or her Texas Rangers series or Maggie Sefton’s newest political mystery Poisoned Politics. I’m happy to report that both Mary and Maggie are charming in real life and exude none of the danger they write about. I wish I had time and space to write more about the books I discovered and the authors I talked to, but I will provide their website addresses below for you to check out. The festival included presentations throughout the day that focused on everything from the History of the Mystery to a talk by Dawn Dowdle, literary agent, about the importance of finding an editor that fits a writer’s needs and genres. While the presentations were being held, many of the authors read from their most recent releases, which was a treat for the readers who attended. If you ever have a chance to visit Suffolk, Virginia, I have a couple pieces of advice. First, try to avoid I-95 at all costs, even if it means walking the entire distance (you’ll get there faster if you walk, anyway). Second, get there on a day when the Suffolk Division of Tourism is hosting one of its tours, such as the Suffolk Ghost Walk (which I missed because I was sitting on I-95) or the Great Dismal Swamp Guided Nature Walk. Third, don’t leave until you check out the Suffolk Center for the Cultural Arts, which is housed in a restored high school and is a beautiful space that houses, among other things, art galleries, a gorgeous theater, a ballroom, and studios for dance, weaving, pottery, photography, and much more. The Suffolk Division of Tourism couldn’t have picked a more breathtaking and inspiring place to hold its Mystery Authors Festival. 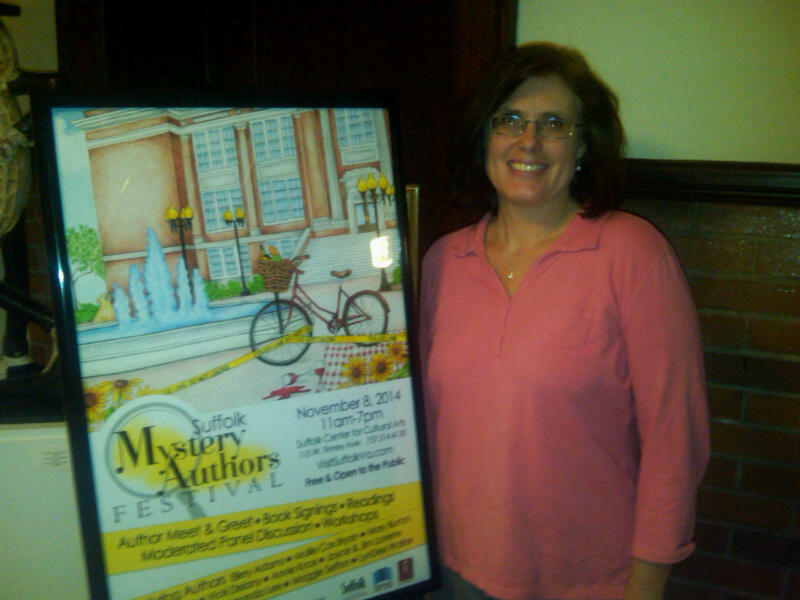 I’m already looking forward to next year’s Mystery Authors Festival!